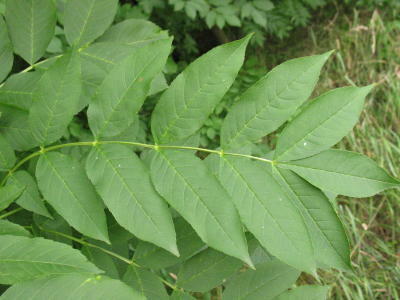 European Ash, Common Ash, Lofty Ash, The Gout Tree. Large deciduous tree with distinctive black buds in spring. Can be coppiced. Height 45m. Age up to 200 years. A native broadleaf and fairly abundant tree. When fully grown it is tall and graceful tree with a light domed canopy. 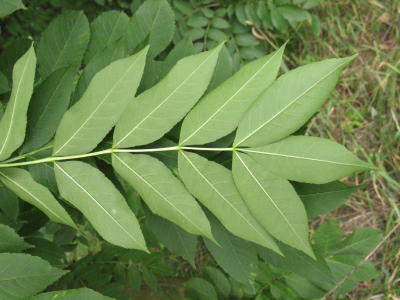 It often grows with other Ash trees and tends to grow smaller and thinner in these conditions. The bark is smooth and grey with fissures that appear as it grows older. The bark colour is thougth to look like Ash hence its name. Mostly calcerous soils although found on all except poorest and acid soils (above ph 5.5). Prefers moist but well drained fertile soils. Up to 450m in altitude. Grows well in mixed stands provided not shaded. Natural distribution throughout British Isles and Europe into Asia Minor and Caucuses. Rare north of Great Glen in Scotland. It grows best on northern and eastern sides of hills where the atmosphere is moist and cool. This tree is often associated with Welsh Woodlands which have these good conditions for growth. It can also survive well near smoke and pollution so is a good urban dweller. This tree has high conservation value. The open airy canopy and short leaf stay allow a lot of sunlight through to the woodland floor and hence a rich and varied ground flora can grow, such as wild garlic and dogs mercury . There is an abundance of food permitting a wide variety of insects and birds. In upland Ash woods the High Brown Fritillary butterfly may be seen. Birds such as Bullfinch enjoy the seeds and Woodcocks, Woodpeckers, Redstarts and the Nuthatch can find plenty of good nesting sites. Pale creamy wood that is strong and elastic. Uses of wood - Hockey sticks, oars, paddles, rudders, billiard cues, cricket stumps, polo sticks and policemen's truncheons. Also used for veneer and furniture. Burns fragrantly when green or dried due to low water content even when green (30 - 35%) but seasoning (to 15% water) does improve efficiency. Grow from seed - deeply dormant - treat as per Acer campestre. Long thin brown seeds approx 25cm long. Approx 8000 germinable seeds per kg. Seeds form in large sprays. If planted green seeds may germinate following spring or even straight away whereas brown seeds will germinate the second spring after planting. Grows quickly to 20 - 40 years old but growth stops at 60 years.